I'm a groupon and savings lover, so often times I search for deals on restaurants just to see what is out there and I jumped as soon as I saw Deejai NoDa listed for a deal! I’ve been wanting to experience more Thai cuisine anyway, so Deejai was already on my list of places to try. Boasting 4.5 stars on Yelp, I had high expectations going and after viewing the menu before going I was even more excited! As a self proclaimed chicken wing tastemaster, I had to get an order of the wings. These crispy chicken wings coated with housemade Thai wings sauce were on point. The sauce coating the wings was super flavorful, and I must say these are some of the best wings in Charlotte. I know it seems odd to go to a Thai restaurant for wings, but trust me….get an order and thank me later. Well when pork belly is on the menu, you order it! I was actually really surprised at the sheer amount of pork belly that Deejai fills these tacos with! Every bite was delicious! These are topped with a fresh Pico de Gallo as well to add a bit of freshness. Overall really good tacos! Of course I had to get Pad Thai! I went with chicken, but they have options for tofu or shrimp as well. 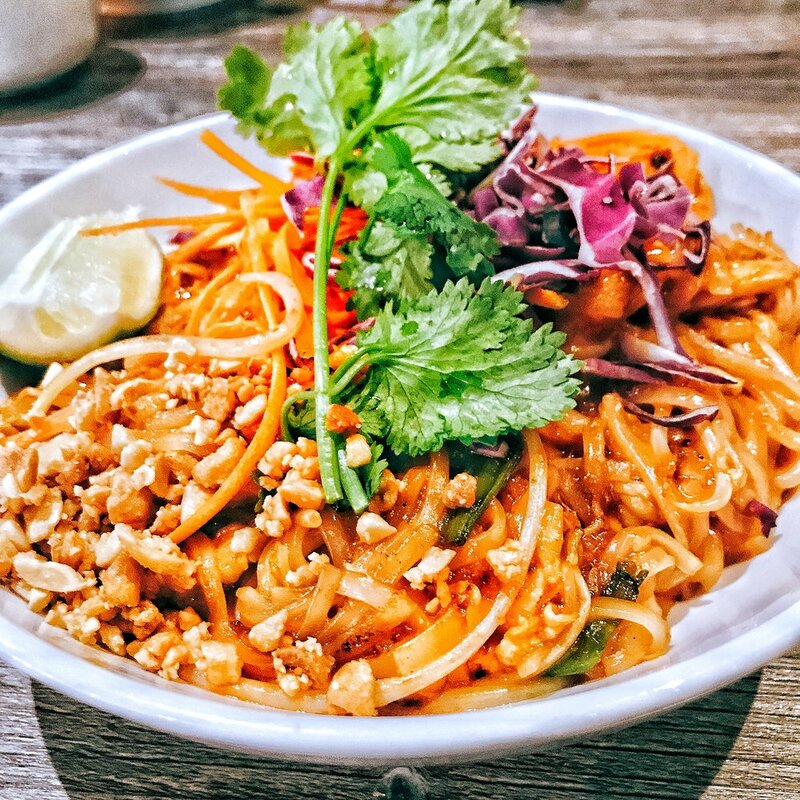 This was THE BEST Pad Thai I’ve had so far in Charlotte! So much so, that I ate way to much of it and then was too full to try their other items, ha! 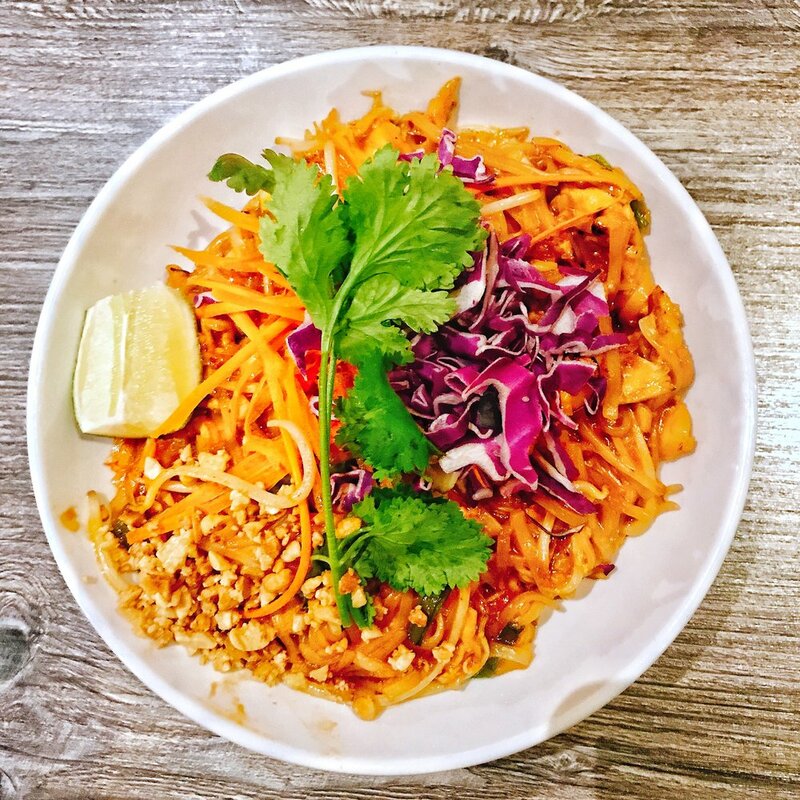 This dish features thin rice noodles with tamarind sauce, serve with bean sprouts, lime wedge, peanuts, and cilantro. Each bite is a flavor bomb. Well done! We also got an order of their Green Curry! Once again, the flavors here were great. This dish features Classic Thai curry, mild to medium spicy green wth green bean, bell pepper, bamboo, eggplant with a choice of chicken, tofu, or shrimp. If you’re a fan of curry, this one will not disappoint. As I said early, Deejai Noda is entirely amazing. I’m definitely a fan of theirs now, and will be going back to this or their other Deejai Thai restaurant off Providence Rd. I definitely want to go back a try a few of their sushi menu items, as they all looked amazing as well while being brought out to our neighboring customers. See you soon Deejai!